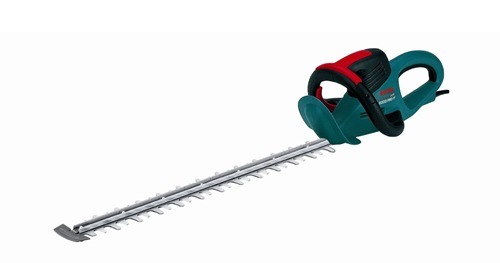 I decided to do a review on the Bosch AHS 6000 Pro T Hedgecutter because, out of all the hedge trimmers I have reviewed, the Bosch AHS 7000 Pro T is the one that most people who go to Amazon from this site actually purchase. The 600 is a very similar hedgecutter with the same 700 watt motor – the main difference is in the blade length which is 600mm compared to 700mm on the other Bosch model. The Bosch AHS 6000 Pro T gets great reviews, there are 36 on Amazon UK, giving an average 4.5 out of a possible 5 stars. This would have been higher except that one person from the USA gave it only one star as they had not realised that this was a model designed for use in the UK with a UK plug! Twenty eight reviewers gave it the maximum five stars, six gave it four stars and the one other reviewer gave it three stars as they found it heavy to use which I found surprising as the machine weighs in at only 4.3 kilos. 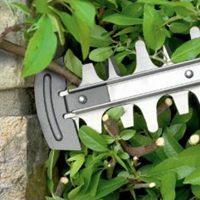 This hedge trimmer is really great if you have larger, thicker hedging to get through. The blades are diamond ground and laser cut to give precision cutting even on thicker twigs. 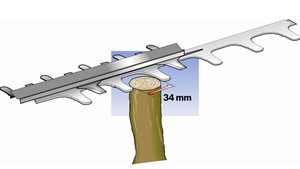 The 34 mm wide tooth spacing means that although it is not meant to be used as a chainsaw, there is not much in the way of normal growth in hedges and brush that would defeat this trimmer – the maximum diameter of a twig or branch to cut is obviously the same as the tooth spacing so in effect you can cut through small branches about an inch in diameter as a maximum – although in practice, the machine will be happier with twigs of half this or smaller for prolonged cutting. However, if you come across a thicker branch unexpectedly in the midst of your hedge, the slipping clutch which ensures smooth running and protection of the gears and blade is a very reassuring feature. From the operator’s point of view, the design and build of this hedge cutter has all the qualities you would expect from Bosch. It has a lightening quick safety brake stop and the ergonomic design and very low vibration reduces operator fatigue and makes even tough jobs a lot easier. Other great safety features are the two trigger system for starting the machine and the blade tip protector which enables safe cutting right down to the ground and close to walls and fences. This is also great from the point of view of protecting the blades from possible damage. There is also a blade cover for safe storage and transportation. There is a useful accessory available for this model which Bosch have named the Collecto 60 – this is an attachment which can be fixed to the blade and which effectively sweeps the clippings from the top of the hedge as you cut – making cleanup that much easier – especially if you use this in conjunction with a strategically placed clippings collection sheet under your working area. The Bosch AHS 6000 Pro T Hedgecutter is amazingly good value for money – especially as it is on sale on Amazon right now at a discounted price and with free UK delivery if you choose the supersaver option. The quality of safety features, and build are as you would expect from Bosch. It is slightly heavier than some electric models but this is offset by the excellent balance and ergonomic design of the machine. A great option if you have a lot of hedges or if you need to cut through thicker twiggy growth on a regular basis. This entry was posted in Electric Trimmer Reviews. Bookmark the permalink.